I’m sure I’m not alone when I say that the older I get the more aware I become of the different seasons of life. We’re coming off one of the busiest times in our life ever. The funny thing about being busy, I’ve recently learned, is that it becomes even easier to stay busy and to take on more and more commitments that keep you busy. Don’t get me wrong–it has been awesome. I wouldn’t have changed a thing. During it all, I was totally aware that we were in this harried phase of life and I just rolled with it. I will always look back at the last six months with so much love, gratitude, and awe. I’m so proud of and humbled by everything we’ve accomplished and created this year. But now…now I am so ready for rest; for things to slow down; to back off; to let go. Conveniently, we’re heading into a time of year that makes this so much easier to do. Soon, I’ll share more about how I plan to do this. You can rest assured it’ll include lots of cooking (and posting here), hot mugs of tea, and quality time by the fireplace. If that doesn’t sound like a dream I don’t know what does! Over the next few weeks, I also plan to share some recipes that I turned to time and again (like, weekly) to help us through this busy season of our lives. We didn’t let our jam-packed schedules cause us to eat out or order in any more than usual. Instead, I created some super simple, healthy, quick, and clean recipes to power us through. So if you find yourself in a busy time of your life right now, I hope they’ll help you, too. 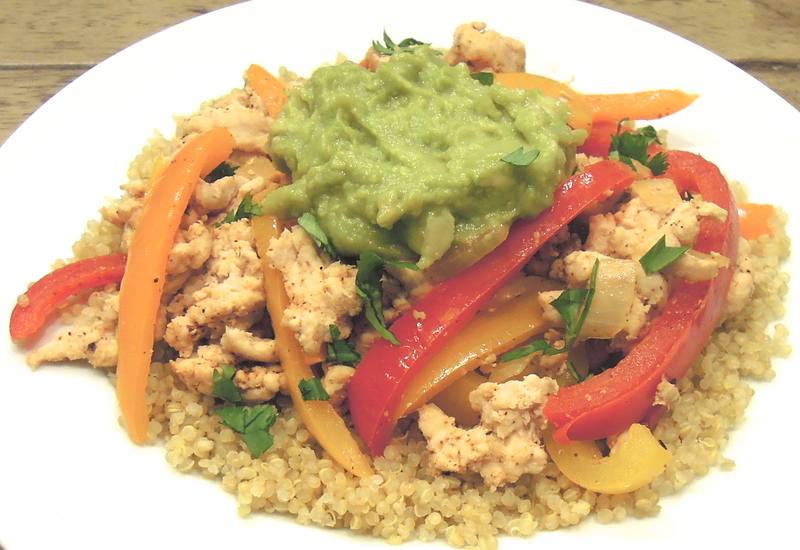 First up is one that I made consistently throughout the summer: Ground turkey and peppers over quinoa. You just brown the turkey and add some spices (chili powder and cumin), saute some peppers and onions, and serve atop fluffy quinoa. Top with chopped cilantro, a generous heap of guacamole, a few spoonfuls of salsa, and shredded cheese (if you like). It’s somewhere between deconstructed chili and fajitas, but completely its own thing. I didn’t even take the time to make the guac. I used Trader Joe’s Avocado’s Number Guacamole, which cost about $4. You get two big packages of the stuff, and it only contains five ingredients: avocados, jalapeno, onion, salt, and garlic. Whether you find yourself in a season of busyness or a reason of rest, it totally hits the spot–along with everything else in this dish! In a skillet, heat olive oil over medium high heat. Add the ground turkey. Let it cook, without stirring, until it begins to brown. Add chili powder, cumin, and some salt. Use a spatula to break the turkey up, and flip it over so the other side browns. Once cooked through, remove the turkey to a plate and set aside. Add the peppers and onion to the pan, season with salt and pepper, and saute until softened, about 5 to 8 minutes. Add the turkey back to the pan and cook until heated through again. 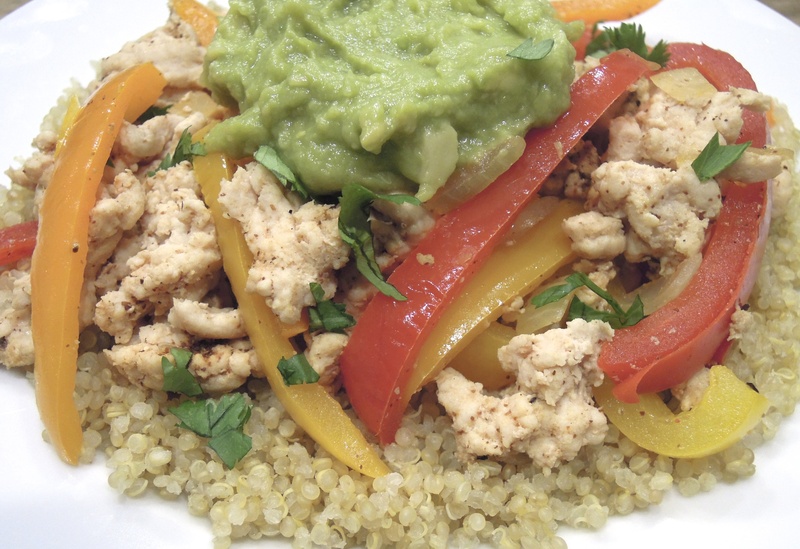 Serve turkey and peppers over quinoa and top with your toppings of choice. This entry was posted in Poultry, Turkey, Vegetables on October 18, 2013 by Paige Greenfield.